Lammie’s mother, Dolly, was captured from the wild in Botswana aged about 3 and arrived at the zoo in 1966. She was euthanised in 2000, aged about 37, when during what should have been a routine immobilization, Lammie fell onto her and dislocated her knee. By then she had given birth to 4 calves, one 1 of which was stillborn. Lammie’s father, Jumbo, was captured from the wild in Botswana aged about 6 and arrived at the zoo in 1966. He died due to infection and enteritis in 1999, aged about 39. He sired 5 calves, including one with his daughter, Lammie. Lammie was born in captivity in 1979. Her father sired her calf which was born in 1991 but lived for only a few days. Lammie mated with Kinkel in 2008 and 2016 but produced no calves. In 2001 she fell into the moat and was reported to have “both right legs stiff” and broke her tusk, but survived. Umfaan (brother) was born in captivity in 1984 and was sold in 1990 aged six. It is not known if he is still alive. Stillborn calf was born to Dolly and Jumbo in 1986. Johnti (brother) born in captivity in 1988. Sold to Peaugres Zoo in France in 1990 aged 18 months. Died in 2004 aged 16. Kinkel fell into the moat in 2007 but was apparently uninjured. He died at Jhb zoo in 2018 aged 35 after a long-term history of chronic colic and eating sand. Lammie spends most of her day against the wall of her enclosure, the only shady place, where she stands doing almost nothing, a sign of boredom and probably depression. Lammie’s only enrichment comes from a few tractor tyres; the zoo has so far failed to deliver the additional promised enrichment items and activities. Lammie’s mud wallow is mostly dry and dusty. 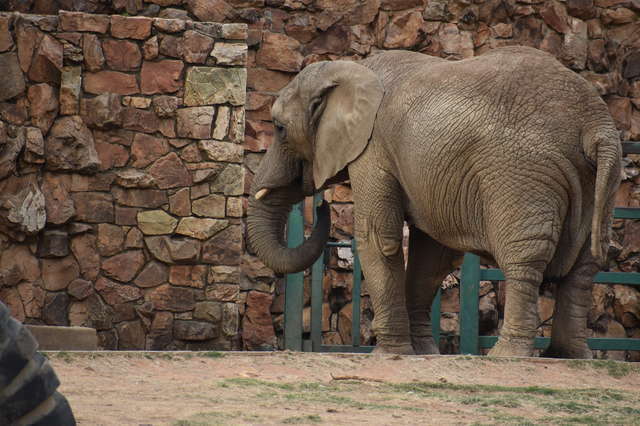 Humane Society International-Africa, the EMS Foundation, and the Elephant Reintegration Trust have joined forces to try to persuade the zoo to move her to a rewilding sanctuary. They offered to pay for and facilitate the translocation with a detailed reintegration proposal by experts, but the zoo has refused. Ban Animal Trading has also been trying to engage and meet with zoo officials to try and persuade the zoo to release Lammie. After conducting measured time budgets during October and January, it was recorded that few people spend more than three minutes at her enclosure. There is no information about the plight of elephants, which are being poached in Africa at the rate of one every 15 minutes or about elephant behaviour. 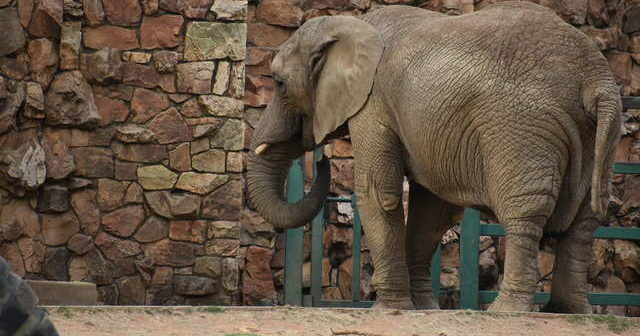 The zoo says it is about to acquire another elephant (contradicting previous statements that no decision had been taken) and expand the enclosure. The NSPCA has opposed a second elephant and has threatened legal action to block it. ‘’Research indicates that a minimum of four related elephant are required to fulfil social requirements. A second elephant would be removed from bonded group and thus compromise the welfare of two elephants It also resigned from the zoo’s Animal Ethics Committee. At last count approximately 270 000 people have signed petitions to free Lammie. On Saturday, 9 February Ban Animal Trading will hold a Free Lammie protest, starting at 11h00 on the corner of Jan Smuts Avenue and Upper Park Drive in Johannesburg. Should elephants be in zoos? There are about 1 500 formal and many more informal zoos in the world holding between three and four million undomesticated, non-human creatures displayed for our curiosity and amusement. Some animals do well in good zoos, but elephants are not among them. Infant mortality for elephants in zoos is almost three times the rate in the wild – for every calf born in a zoo, on average another two die. 40% of elephants in zoos display atypical stereotyped behaviour such as swaying, rocking and placing vegetation/food on their heads. We need to ask: What is the conservation value to the species of the indviduals confined in zoos, and are the conditions under which they’re held conducive to their physical and psychological wellbeing? Zoos are a tangible link to a colonial past and reminders of the conquest of distant lands. Thousands of healthy zoo animals are ‘zoothanized’ each year because of over-breeding. A yardstick could be a ‘first do no harm’ principle, ensuring that compassion and individual welfare are at the heart of zoo construction and animal keeping. A ‘do no harm’ principle, however, puts elephants beyond the capability of zoos, something that zoo management is increasingly acknowledging. Since 2000, a total of 37 zoos in Europe have closed their elephant exhibits, including London’s Regent’s Park, because they could not provide “appropriate facilities for such large, far-roaming, intelligent animals”. Given new insights into how animals may suffer from anxiety and depression when they’re removed from nature, should they be held in captivity?